Street art in the Zone? This sound bizarre enough, doesn't it? 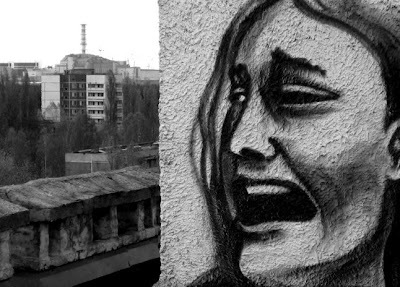 But if you've seen recent pictures from Pripyat, you may have noticed some strange graffiti on the walls. Most of these depict people, supposedly in their original environment. Screaming faces, playing children. Dark and disturbing images. Right before the twentieth anniversary of the disaster, seven artists from Moscow, Minsk and Berlin traveled to Pripyat. As a strange artistic and social project, they've painted graffiti on the walls of homes and other buildings - interacting with the dead city. You can read more about the project and see their work on this site. Radiating Places - A requiem of a special kind.